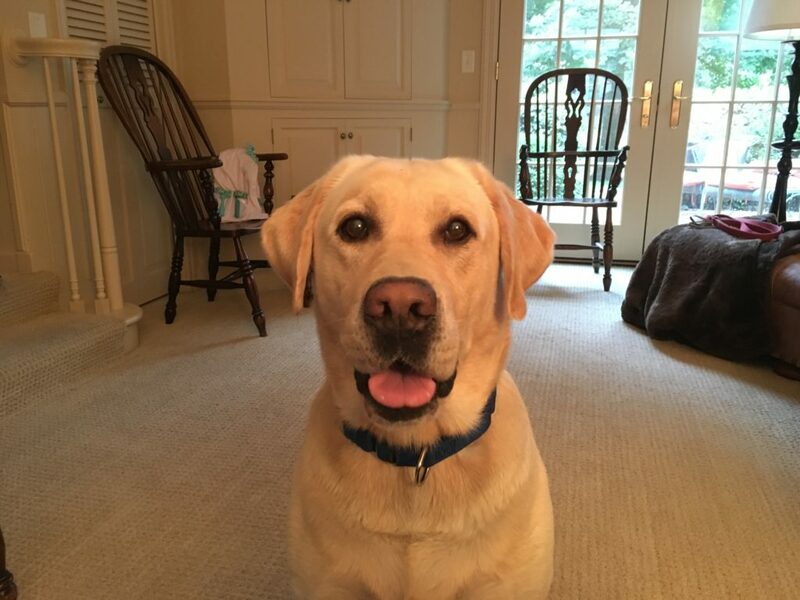 Stanley is a five-year-old Yellow Lab who lives next door to another client. They set up a dog obedience training session with me to help Stanley stop pulling on the leash when he see’s other dogs, stop him from running out open doors, doesn’t always listen to humans and runs the house according to his guardians. I had met Stanley a few weeks ago while I was working with another client who is a neighbor. His guardians were struggling to keep him in line on the walk which was more challenging than usual as I was walking another dog. I did a little leash training on the spot, but they wanted to go deeper so we set up an in home dog training session. I sat down with Stanley and his guardians to observe the dog and get more information about his day-to-day routine. In the course of that discussion I identified a number of interactions that the humans were making that were likely giving Stanley the wrong impression. Because Stanley did not really have a lot of rules to follow, he had gotten the impression that he had the same authority has his humans. As a result of this perception, Stanley only listened when he felt like it. I suggested that the guardians incorporate some simple rules and boundaries. I consistently enforcing these rules with good timing we can help Stanley shift into a followers mindset while simultaneously reducing the stress in his life. If a dog thinks that it is in charge of humans, it’s natural for them to feel some stress and pressure from that responsibility. To help Stanley’s guardians to start to assume more of a leadership position in his eyes, I went over a way of adding structure to their application of affection. By asking the dog to sit or lay down before they pet him, they can help Stanley identify as a follower who needs to ask for rather than demand attention. I also shared a set of four escalating consequences that I developed. I use these to disagree with the dogs anytime it breaks boundaries or limits. Because they were derived from how dogs interact with one another, most dogs respond to them instantly. I wanted to give Stanley’s guardians a tool that will help them redirect his attention and focus away from any dogs that he may want to react to. I learned about the watch technique from my mentor Karen London in her book FEISTY FIDO – HELP FOR THE LEASH REACTIVE DOG, 2ND EDITION. It may seem incredibly simple but don’t be fooled, it is extremely effective. I have use this technique to successfully rehabilitate a number of dog aggressive dogs. But it’s not important that I can redirect Stanley, the real challenge is to make sure that his guardians can achieve the same results when Im not there. We switched positions and one of his guardians practice the exercise with him. As you can see in the video, Stanley started to respond better and better the more we practiced. By the time the next guardian took his turn, Stanley was looking up at him almost immediately. The guardians will need to make sure that they are raising the treat up so that it is between their eyes and Stanley’s eyes then move the tree towards his mouth. The instant the tree touches Stanley’s lips, they need to say the command word of watch. During our practice sessions both guardians were saying the command word before they deliver the treat which can confuse the dog a bit. But with a little bit of practice their technique will get better just like Stanley’s did. We headed outside so that I could show the guardians how to get Stanley to walk on a loose leash. However I made a mistake that distracted Stanley to such an extent that teaching him to walk in the heel was not possible. Instead I used the opportunity to explain how his guardians can add on to the watch exercise that we had started inside. The watch is very easy to do which can cause many people to abandon it early. The key with the watch is the practice it under control settings until the dog has mastered the basics. Then you gradually start increasing the distractions until you get to the point where you can practice it while other dogs are nearby. The important thing is for the humans to continue practicing each step of the progression until the dog has it down pat. Many people push too far too fast which puts the dog in a position to fail. Because Stanley is so big and powerful, it’s going to be even more important for his guardians to keep practicing each step before moving forward. We don’t want to physically control the dog, we want the dog to learn how to develop self-control. Stanley decided that he needed to take a little bit of a break and cool down as I was wrapping up the next steps to the watch exercise. I have to admit, this is the first time that I have seen a dog that has his own personal outdoor Jacuzzi, LOL. One of the other major problem Stanley’s guardians wanted to address was his behavior at the door. I had one of the guardians step outside to pretend to be a guest so that I can show the other guardian how they could utilize the escalating consequences to communicate that Stanley was to stay away from the door and let the humans handle it. Because I controlled the situation before I actually opened the door, Stanley was able to restrain himself. Having a dog stop and control itself is a very powerful technique. We reset the exercise so that we can run through it again but this time with one of Stanley’s guardians answering the door. Because we had practiced the exercise a few times, it was easier for the guardian to control Stanley in the above video. I suggested that they call or text one another when they are arriving home so that the couple that owns Stanley can practice this exercise without the pressure of it being an actual guest. Usually takes the dog 10 to 12 repetitions at this exercise before they start waiting behind the boundary to the door and letting their humans handle it. By the end of the session, Stanley was showing more respect for people’s personal space, was responding to the watch exercise right away and even starting to follow some of the new rules on his own. Stanley is a great dog who was simply confused as to his place in the families home. By communicating with him in a way that he understands, consistently enforcing the new rules and boundaries with good timing and practiced at the watch exercise, Stanley should be able to adopt new behaviors and stop getting so excited or reactive.